Founded by several stakeholders (Sciences Po, the Körber Foundation, the Mo Ibrahim Foundation, the Institut français des relations internationales – IFRI, the Montaigne Institute and the French Republic, represented by the Ministry of Foreign and European Affairs), the first Paris Peace Forum was organised on the occasion of the commemoration of the end of World War I. The Forum is envisioned as a recurring, annual event to promote governance solutions on five key issues: Peace and security, environment, development, new technologies and inclusive economies. Numerous Heads of State and elected representatives attended the opening session. Regional and international organisations, including UN agencies participated as well as civil society in its broadest sense (private sector, NGOs, foundations, think tanks, media, trade unions, religious leaders, philanthropists, experts, etc.). A “mini agora” with the participation of Khaled Mansour, member of the IEC, and Jean-Marie Guéhenno former Under-Secretary-General for Peacekeeping Operations and former head of the International Crisis Group. 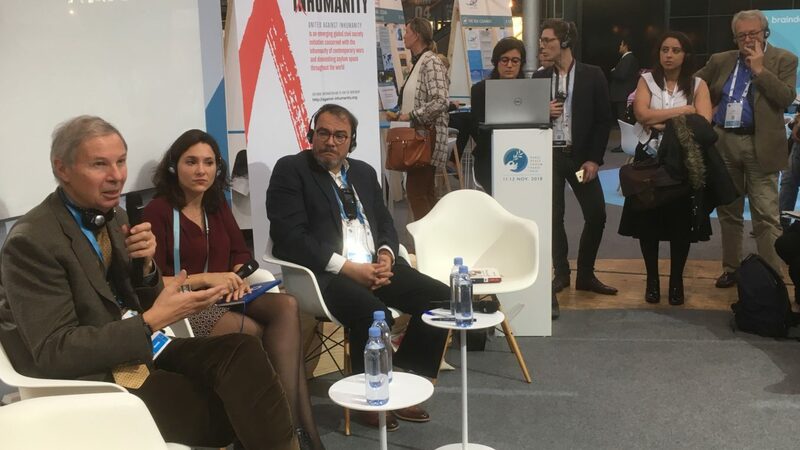 Pauline Chetcuti, Head of Humanitarian Advocacy and Policy at Action contre la Faim acted as moderator on behalf of Humanitarian Alternatives. UAI’s mini-agora at the Paris Peace Forum at a glance! With the moderation of Pauline Chetcuti and the participation of Khaled Mansour & Jean-Marie Guéhenno. A half hour “Pitch slot” where Antonio Donini and Norah Niland presented UAI. The Paris Peace Forum also allowed for significant networking facilitated by the Call to Action hand-out as well as chance encounters with various participants. Various events such as a large agora on “The Long Road towards a Comprehensive Approach to International Migration” allowed for UAI intervention as well as networking.